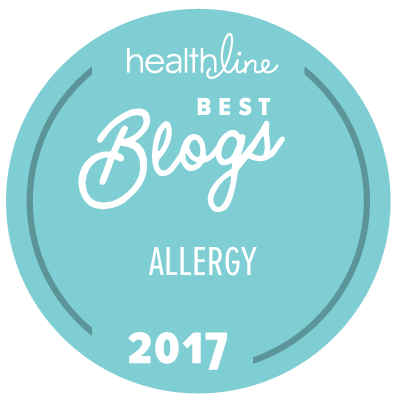 I received a letter from a reader who suffers from coconut allergies, and like everyone first diagnosed with an allergy, she is struggling. So I thought I’d begin a response to her on this blog, and ask readers to weigh in. I am allergic to coconut and coconut oil. These are found in all kinds of things from shampoos, to breakfast cereals, and any mint flavored ice cream product on the market. I can't even eat popcorn at the movies any more because theaters use coconut oil to cook popcorn. One of the biggest problems people with this allergy are facing is that it is being marketed as being healthier and a good allergy free alternative. Help! Dear Dyana, I am sorry to hear that you have a food allergy. Yes, I know how you feel, and I understand that everywhere you look you see your food allergen. This is good news, because you can’t avoid what you can’t see. I think this is heightened awareness (kind of like after you buy a red car you notice every red car on the road). The solution, of course, is to avoid coconut. First, let me address food. While many of us (myself included) believe that coconut should not be classified as a nut, the FDA includes coconut in their classification of tree nuts. That is good news for you, because the top eight food allergens (including tree nuts) must be clearly called out on all food labels. That should help you pinpoint which products do (and do not) contain coconut. But those food labeling laws only pertain to things we eat – not cosmetics, shampoos, etc. I understand this problem well; as more manufacturers are trying to remove parabens from their products, they are replacing them with “natural” ingredients (like wheat and soy proteins which I am allergic to and nut oils including coconut). This means that we have to dig deeper when checking ingredients. You are correct that coconut oil is being embraced – especially by vegans, and yes – even some of us in the food allergy community. For those who are allergic to milk, coconut oil can be a great alternative to butter/margarine, and coconut milk is a terrific non-dairy milk to bake with. But the good news for you is that you can substitute milk or butter back in, where those products are called for in recipes. Now, I’ll open it up to the readers. What advice do you have for Dyana? Are there any coconut-allergic people out there who have products to suggest? I am just loving going out to the farm every week to pick up my CSA share. While it seems that many CSA’s have set items for their shareholders every week, at the Poughkeepsie Farm Project I (mostly) get to pick what I want to take home. For me, this has been a veggie-exploration. Each week I find and try something new – brand new to me. This week I was intrigued when I saw amaranth on the board. I am familiar with amaranth as a grain – in fact, it is one of my favorite gluten-free grains for baking (mixed with other grains) – but I had never heard of amaranth as a vegetable. After a bit of research, I learned that the leaves of the amaranth plant – which are high in protein – are used as cooking greens. Raw, they have a bitter taste (I don’t recommend it for salads). Cooked, they are probably most similar to spinach. I also learned that amaranth is popular in Mexico, and was believed by the Aztecs to have magical properties due to its intense color. The other advantage of bringing home new things from the farm every week is that it gives me endless opportunities to practice my food photography. Have you tried amaranth cooking greens? What have you made with them? Nearly three years past the 2008 deadline, the FDA is finally getting serious about defining what “gluten-free” means on food labels. Today, without a standard by the FDA, there is no legal requirement that needs to be met for a manufacturer to label food “gluten-free.” This has led to confusion for consumers and considerable angst for the 1 in 133 of them that suffer from celiac disease. Gluten is found in wheat, rye, barley, and hybrids of these grains. Those who suffer from celiac disease, an autoimmune disorder, cannot absorb the gluten found in these grains, resulting in damage to the intestines. 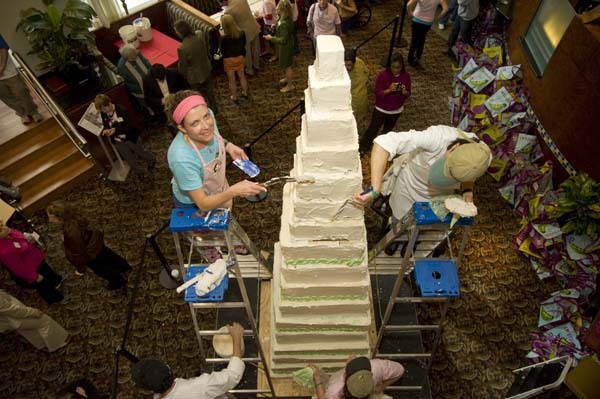 With 10000 signatures on a petition that accompanied the building of the world’s largest gluten-free cake at a recent gluten-free labeling summit in Washington, the voices are now loud enough for Congress to take action. On August 3rd, the FDA re-opened the comment period for a proposed gluten-free labeling law. Andrea Levario, the Executive Director of the American Celiac Disease Alliance (ACDA) spoke to Jules Dowler Shepard, one of the leaders of the 1 in 133 movement, in a web interview on August 4th. Levario noted that there was complexity in implementing gluten-free labeling laws – an acceptable threshold of gluten needed to be determined – making it trickier than the labeling of food allergens. A safety assessment needed to be completed. That safety assessment has concluded that, based on the scientific evidence available today, 20 parts per million (ppm) of gluten is a safe level for those with celiac disease, supporting the proposed law. A product may be labeled “gluten-free” only if it is at or below the defined threshold of 20 ppm, a number that is generally accepted by experts as safe for those with celiac disease. Products that are inherently free of gluten (e.g. non-grain products) will be in violation of the law if they are labeled “gluten-free." The labeling will be voluntary. The lack of a statement on gluten will not mean that there is no gluten in the product. Levario hopes to see the standard out by the third quarter of 2012. It is expected that there will be a lag time set for products to conform. The comment period is open until October 3rd. On a more fun note, there's only three days left to enter to win a year's supply of paper towels and a $50 VISA card. Find out how to enter here. 1. I rarely win anything. 2. I am a big fan of paper towels. In a food allergy family, paper towels can even be called a necessity; you just don't want to risk that someone used the dishtowel to clean up a milk spill, or that a wheat-eating family member used the cloth towel to wipe their hands after making a sandwich. Paper towels help me keep my kitchen contaminant-free. But enough about that (for today anyway), on to my story. Last week I attended the BlogHer conference in San Diego. This is a very-big-almost-overwhelming conference. In addition to great programming and parties, there is an expo hall – an enormous expo hall – with hundreds of vendors. The evening before the conference started there was an expo party - two hours dedicated to checking out the products, collecting samples (so much that many attendees bring an extra suitcase to carry it all home in). Imagine 3500 women storming the doors at 6pm to be the first in line to get their loot. I am exaggerating, but not much. I was tired from a long trip across the country, but the expo was clearly the place to be. I was visiting booths and trying to pick up only what I would actually take home, when I stumbled upon the Brawny paper towel exhibit. As I mentioned, I am a fan of paper towels, yet I couldn't imagine trying to stuff a roll of paper towels in my suitcase. But the Brawny team (who surprisingly all look like the Brawny man) asked if I wanted to enter a contest and my ears perked up. 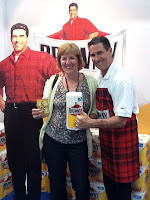 All I had to do was have my picture taken with the Brawny man (an oversized cardboard figure) and tweet my picture. Sounded easy enough. I entered and went about my business collecting stuff, finding great food to try (like the gluten-free cupcakes you see here), and making new friends. I told you that I rarely win anything, right? Despite the dozens of contests I entered, I figured the odds were against me. The next morning there was an email in my inbox that said, "Congratulations, you won the Brawny giveaway, please stop by the Brawny booth to claim your prize." I made a mental note to return to the booth, certain that they would hand me a roll of paper towels and I’d be on my way. When I made it back after lunch (and after a totally fabulous and unexpected flash mob), I stopped by to see the Brawny team. I was treated like a celebrity. I was indeed the winner of the big prize - a year’s supply of Brawny paper towels and a $50 visa card. Of course I was delighted. "Just exactly how much is a year’s supply of paper towels?" I asked. I don't know the answer yet, but was told not to worry, they would deliver them to me. But wait, there's more! Are you ready for this? Because I was the grand prize winner one of my readers wins too! Brawny is giving away a year’s supply of Brawny paper towels and a $50 visa gift card to one of my readers. I don't really get giddy, but if I did I would have been giddy with excitement, because this is a truly awesome giveaway. See the smile on my face? Because this is such an awesome giveaway, you can enter up to three times. You get one entry for leaving a comment here telling me what you like about Brawny paper towels. For a second entry, tweet this giveaway (just click the twitter sharing link below the post) and leave a second comment that you tweeted it. For a third entry, visit the Brawny facebook page and click like, then leave a comment letting me know you did so. The contest ends Sunday August 21st at midnight. That gives you a week to enter. One lucky winner will be announced on Monday August 22nd. Don't forget to come back to see if you have won. I’ll need to get your contact info so your prize can be shipped to you. A big thank you to Brawny for being one of the BlogHer '11 event sponsors and hosting this giveaway! Congratulations to Alisa, the winner of the Food Cures book by Joy Bauer! Alisa, I will e-mail you for your address. But wait – I have more news. It’s starting to feel like August is giveaway month. We like giveaways, right? Be sure to come back on Monday because I will be announcing a very big, awesome, special giveaway. This is one you won’t want to miss! Food Cures. To many of us dealing with food allergies that may sound like an oxymoron. We all know that food – certain foods at least – can make us sick. Nevertheless, I jumped at the chance to review two of Joy Bauer’s books – Slim & Scrumptious and Food Cures. After all, we can always eat healthier, right? It’s been a long time since I’ve focused on cookbooks that aren't specifically allergen-free or gluten-free food. But my family has joined a CSA (Community Supported Agriculture) project for the summer, and I am suddenly overwhelmed with foods like kale, and radicchio, and bok choy, so when the folks at joybauer.com offered to send me two of Joy's cookbooks, I jumped at the chance. New recipes are always welcome – especially healthy recipes. 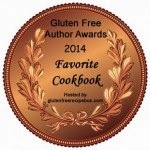 Slim & Scrumptious, while not aimed at a gluten-free or allergen-free audience, has a lot of great options – in fact almost every recipe in the book can either be made as-is, or substituted for the few food allergens she does include. Joy uses ingredients like quinoa, and beans, and lots and lots of veggies. I recently made the Crispy Kale Chips and they are a winner! Food Cures is first and foremost about weight loss/management and nutrition. It’s all about healthy food. Unlike any book I have seen, the book addresses nutrition by illness, recommending foods to eat and avoid for a variety of health problems. It covers everything from heart disease, arthritis, and diabetes, to migraines and more. No, food allergies are not discussed, but there is a very well informed section on celiac disease. All in all this is a very handy book to have – especially if you or someone in your family is dealing with chronic health issues. Find out more about Food Cures at Joy Bauer's website. And just to be clear – the food doesn’t actually “cure”. Instead, it’s about eating the right foods to stay healthy. 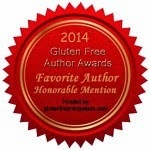 I am giving away a copy of Joy Bauer’s Food Cures. To enter, leave a comment here. Anything will do (including the weather). For an extra entry, follow me on twitter, and leave a second comment here with your twitter handle so I can count you and follow you back. You have until Wednesday August 10th at midnight to enter. The winner will be announced the following day. Please come back to see if you won! Most of the time I am reviewing allergen-free products that I really enjoy on this blog. Sometimes, I get really excited about trying something new, only to be disappointed. That was the case with this organic black bean spaghetti that I tried recently. I love pasta. I have had white bean pastas that I really enjoy, so when I found this black bean pasta I had high hopes. I prepared a classic tomato sauce to top if off and it looked really good. But as soon as I took the first bite I was disappointed. The taste was bland, and the spaghetti was rubbery. I won’t be buying this one again. What’s the worse gluten-free or allergen-free product you have tried?